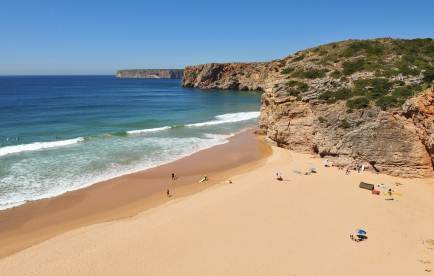 Algarve beach,this is what you can expect Surfing throughout the Algarve. Welcome to Algarve Ocean Boarding. Wrong page.Click here for Algarve Activities Main Page. Click here for East-West-Algarve HomepageThe Algarve has some of the best conditions in the world for water-sports.Its shoreline opens entirely onto the Atlantic Ocean. There are many schools and hire facilities for all skill levels.The west region is probably the best for water sport enthusiasts.It is Europes most westerly land point. IS IT RIGHT FOR Y0U? Experienced surfers will love the Autumn through to spring season for surfing.This is when you can pick up the challenging waves.This is when the swells are at their biggest and the waves can be very consistent.Indeed it is great for all water sports. It should not surprise anybody!Just look at any map,it is Portugals equivalent of Lands End in Cornwall England.It is stuck out in the Atlantic ocean on the countries most westerly point.Poised to pick up all the wind agitated water from the open mass of the Atlantic Ocean! For the newbies to surfing sports it follows the gentler summer conditions will produce smaller swells and gentler waves.Ideal conditions to wet your water wings!Of course,somewhat unfairly everything is so much more expensive for the learners in summertime but I guess if you are considering taking up surfing,you would have the finances and savings to support such an expensive activity.However cost can be greatly reduced if you talk to the experts in this sort of holiday,where everything is worked into one holiday package. Another major advantage of the western end of the Algarve is that it is not so heavily developed and so there are more empty beaches giving the space needed for surf boards.This does not mean it is lacking in tourist faciolities far from it you will find because the surfing schools are located here the sort of tourist facilities you would appreciate are in abundance here.Major hot spots for boarders are :LAGOSAn exciting town with award winning marina.When the swells are large the surfing is done on the lovely sandy beaches to the west of the town.On days when the swells are not so big it is just forty minutes drive to the rougher western tip where the waves are always more consistent! Carrapateira is a smallish frienldy village on the western coast.It has just a few bars and restaurant which are frequented by boarding communities.It is about two hours twenty minutes from Faro airportThere are two good Praia,s (beaches)This probably is more suited to more experienced boarders who can find the empty peaks.Here you will find some of the most reliable conditions and most exciting waves! Arrifana western Algarve is a super boarding beach town with a well protected cove and a broad typically sandy beach.Here seafood rules in the town and is caught in the local waters for ultimate freshness.It is close to the more major town of Aljezur.It has its own beach and another good boarding beach nearby called,Monte Clerijo.Plus other well known beaches of Amoeira,Odeciexe and the above mentioned Carrapateira.So boarding paradise!Arrifana is probably Portugals premier big wave areas.There is a wave known as "The Point" which is both spectacular to ride or just to watch.Here conditions can be found for all abilities inside the beachbreak which holds waves up to six foot high. Lagos is a gorgeous town set in the Western Algarve right next to the Atlantic Oceans pristine beaches and water.One school you should really give much consideration to is 'Extreme Algarve' who as the name suggests cater for all types of extreme sports.They have air-conditioned vans to whisk you around the best water-sports locations in western Algarve. Learn to kitesurf with them or improve your kitesurfing with one of the best schools in Portugal.Utilising the finest kitesurf spot in the Algarve - the Alvor estuary. You can diversify into other extreme sports such as rock climbing Sagres' famous sea-cliffs, try a few sessions of wakeboarding or go mountain biking. All daily activities tend to end up patying with other groups of like minded people.The town of Lagos is well known for its culinary delights in one of the many excellent restaurants. This area can boast winds of 21 knots which is great for all water-sport enthusiasts.With Extreme Algarve you can hire the gear and have the option of a safety boat on hand. 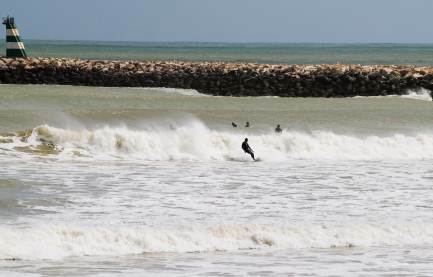 Their camp in the Algarve gets in full flow with nature dishing out it's usual summer Atlantic swell.They say that: "For our customers, we have a new air-conditioned van for a more comfy ride to and from the Algarve's top water-sports beaches and we've stocked up on some new wetties and surfboards to. WOW! Refreshing or what!This picture really makes me wish I was not disabled by that working accident!I will never experince boarding like this. It does hurt that I never had the chance to do anything like this.As a child my parents although rich would never pay for me to go on any school trips. As an adult with my own scaffolding business I could not take time off for holidays.Now I can never experience this sort of activity.So those of you who can,make the most of your health.You never know when something will happen to take it away.I thought I was 'immortal' and 'indestructible'. I think this picture must capture that famous Atlantic swell I hear so much about.If its not goodness only knows how big the waves in the swell must be. What a cracking picture though,just imagine walking off the beach in the top picture with your Surfing board.Then hitting waves like this.It must be a phenomenal experience.That picture was taken off the Portuguese coastline! Another good school is The Algarve Surfing school.Who operate out of the lovely town of Sagres and Amado beach.They are well established and highly thought of and offer something for everybody.The school was actually opened in 1996 and has in that period of time become one of the premier suppliers of instruction. Group lessons are a fun and economical way to learn . These are a maximum of up to 8 people per instructor. The school recommends 2 surfing lessons per day for learners.Both Intermediate and advanced lessons are available.For a price starting at around 50 euros,you can get per day 2 lessons of 1hour 30 minutes,with surfboard and a wetsuit included and of course the very neccessary sports insurance. Below we give an idea of current prices but as you know they cannot be guaranteed.It is there as a guideline for you.Remember summertime in the Algarve is more expensive for anything,tourist rates apply.The high sason prices below are of course summertime.